Sadhu collection of scarves and stoles are inspired by the glorious heritage of Kashmir and its unparalleled beauty. They showcase the 2000 year old legacy of Pashmina as narrated by Kashmiri weavers, the seekers and keepers of this ancient skill. And they encapsulate in their design, the pristine beauty of Kashmir and all her mystic brilliance. SADHU Pashminas are born and bred in Kashmir, using the traditional skills of indigenous Kashmiri spinners and weavers. Totally unadulterated and completely natural, SADHU products wear the hallmark of purity. No mechanised processes and chemicals are used in the yarn-making process. This makes the SADHU range of scarves and shawls feather-light, whisper-soft and thoroughly warm… like wearing a wisp of magic on your skin. Classic designs that exude elegance and sophistication are the hallmark of SADHU. The tasteful interplay of colours, the asymmetric lines and traditional weave imparts a unique and timeless quality thus transforming ethnic weaves into luxury offerings. The brand is committed to preserving the heritage of Pashmina and sustainable methods of production. 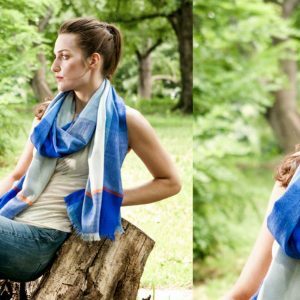 Right from sourcing to dyeing to spinning and weaving, SADHU scarves and shawls are entirely handmade, making them 100% sustainable. They are a perfect tribute to the dying art of hand weaving and hand spinning, empowering Kashmiri weavers and artisans, while preserving and promoting the traditional production techniques of the region, believed to be two thousand years old.